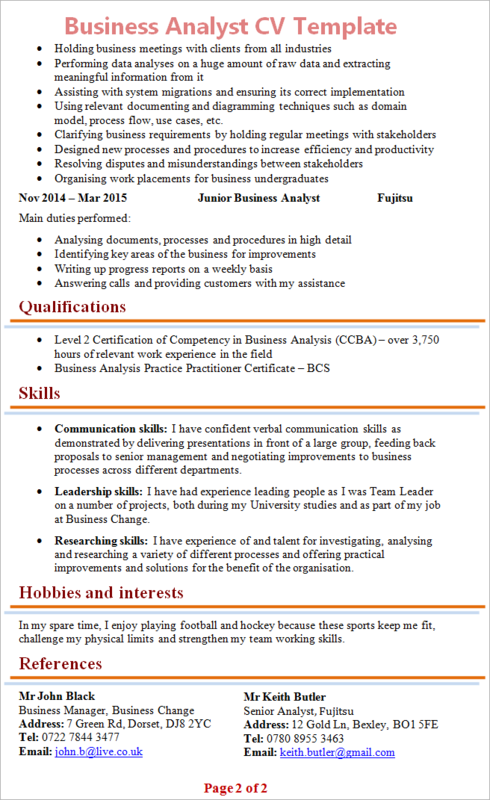 Tip: Use the Business Analyst CV Template below as an example to help you write your own personal and fully-tailored CV. I am a hardworking and motivated Business Analyst who has acquired extensive knowledge in the field through the study of Business & Management at degree level and previous work experience in establishing business requirements, performing gap analysis, designing business processes and implementing system improvements to increase productivity and reduce costs. Additionally, I have strengthened my skills in the work environment with over 3,000 hours of experience involving a multitude of analytical tasks. Moreover, I have contributed immensely to improving the business by successfully managing projects resulting in increased performance and productivity. Using relevant documenting and diagramming techniques such as domain model, process flow, use cases, etc. Communication skills: I have confident verbal communication skills as demonstrated by delivering presentations in front of a large group, feeding back proposals to senior management and negotiating improvements to business processes across different departments. Leadership skills: I have had experience leading people as I was Team Leader on a number of projects, both during my University studies and as part of my job at Business Change. Researching Skills: I have experience of and talent for investigating, analysing and researching a variety of different processes and offering practical improvements and solutions for the benefit of the organisation. In my spare time, I enjoy playing football and hockey because these sports keep me fit, challenge my physical limits and strengthen my team working skills. Analytical skills: As a Business Analyst you will be spending most of your time on analysing, investigating, establishing and documenting business processes and activities. It is, therefore, essential that you demonstrate on your CV, with real-world examples, that you have the ability to work with raw data, drawing diagrams, gathering information, establishing procedures, interviewing people and proposing practical solutions based upon the results of the analyses.